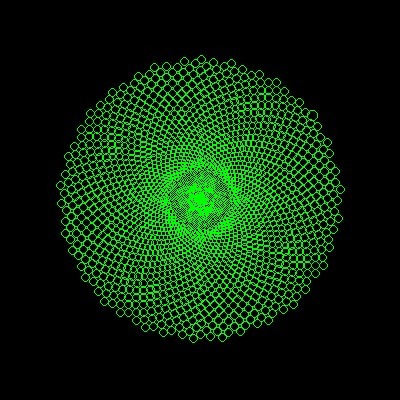 Sunflower fractal is a draft programming task. It is not yet considered ready to be promoted as a complete task, for reasons that should be found in its talk page. The colouring of the "fractal" is determined with every iteration to ensure that the resulting graphic looks similar to a real Sunflower, thus the parameter diskRatio determines the radius of the central disk as the maximum radius of the flower is known from the number of iterations. The scaling factor is currently hardcoded but can also be externalized. Requires the WinBGIm library. The image produced, when viewed with (for example) EOG, is similar to the Ring entry. This is not really a fractal. It is more accurately an example of a Fibonacci spiral or Phi-packing. This page was last modified on 6 November 2018, at 06:46.